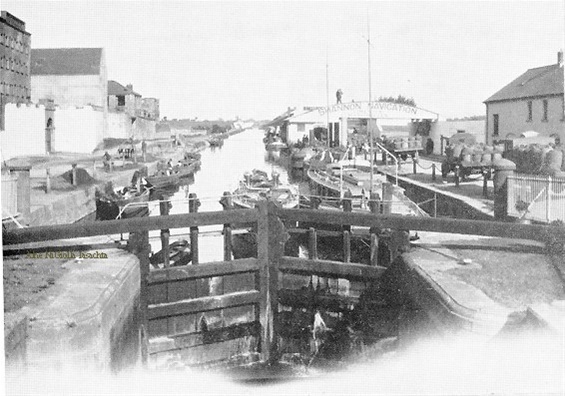 CANAL HARBOUR, LOCK QUAY. The barges from here went as far as Lough Allen. Lock Mills can be seen on the left. The derelict building (left background) was a brewery. 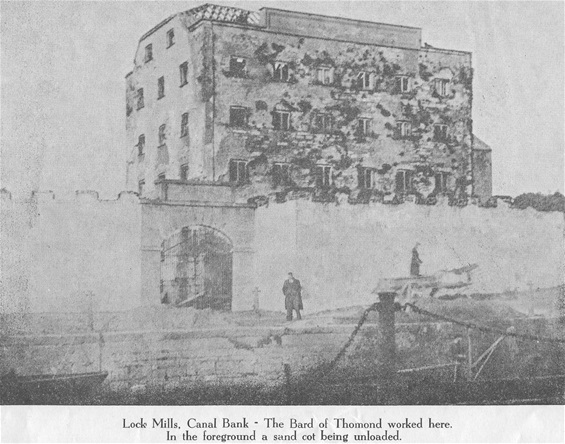 The headquarters of the Limerick Sand Co. was also here. The sand cots can be seen unloading their sand which was dredged at Plassy. 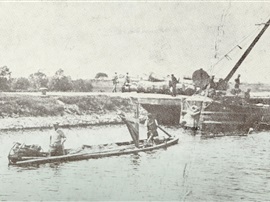 The sand cots were then towed by manpower from the head of the canal and their contents sold for two shillings a horseload delivered. All C.I.E. traffic ceased on 31st December 1959. Guinness operated here until 1960. The last barge from Limerick - 51M left St. James' Harbour, Dublin in 1960. The widows brother did not get the job, so mother and daughter had to vacate the house. 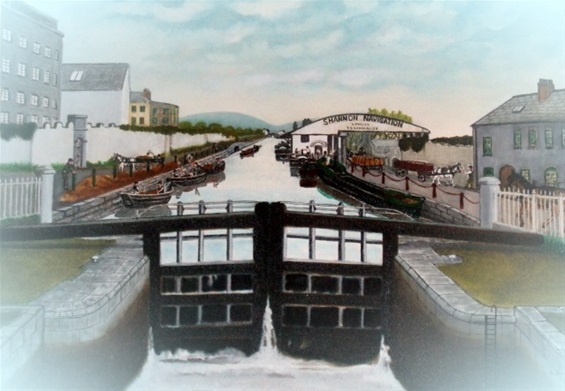 Paddy Allen was employed and resided at the Tidal Lock to the Canal Harbour, Lock Quay, Limerick. He was required to be on duty on Sundays and caretaker to two locks and buildings adjacent, as the Quays of the Harbour were open to the public. His duties included the lighting and extinguishing of lamps and tending to two locks generally. Regular overtime on Sundays and before and after normal working hours on week days was involved. For this overtime Allen was paid 10s. 10d. per week up to 1929, (the year Ardnacrusha Power Station opened) and from 1929 until his sudden death in 1941, 16s. 3d. per week over the normal rate of pay which was £1. 7s. 6d. per week. Salary at time of death £1-7s-6d. Overtime £0-16s-3d. Shannon Bonus £0-5s-0d. Free house valued at £0-2s-6d. Total per week £2-11s-3d. SANDCOT AT CANAL HARBOUR. 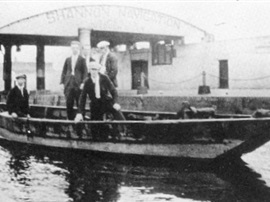 The sandcot men came from St. Mary's parish, they were the Frawley's, Shanahan's and Crowes. LOADED SANDCOTS AT CANAL HARBOUR, LIMERICK. Just below the Black Bridge at Plassey, is a stretch of river known as The Sands of Blackwater. There the sandmen dredged sand from the river bed. Hi Meg, it would be lovely to meet, I'm also living near Lax Weir, so, we must be neighbours. Hello Ann, Lovely web site! thanks for putting this together. 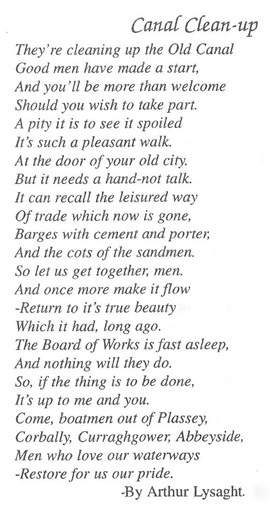 I'd love to meet you if possible: I'm living near the lax weir and fascinated by its history.